Stefco Hardwound Natural Paper Towel - 1 Ply - 12 / Carton - 5.50\"
Hardwound paper towel rolls are designed for use in Stefco Hardwound Lever Dispensers and Hardwound 8" Easy Touch Bump Bar Dispensers. Strong, absorbent, one-ply towels provide effective hand-drying with less paper. They are also edge embossed and not perforated for customized sizing. 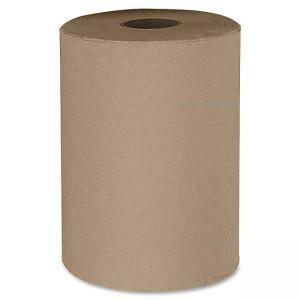 Each towel roll offers a 2" core and a 5-1/2" overall diameter.